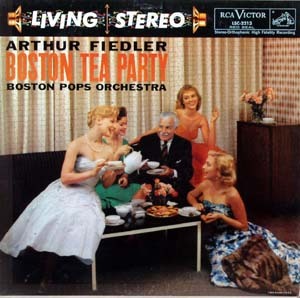 1958 Fiedler Boston Tea Party performed by Boston Pops Orchestra including The Merry Wives of Windsor Overture, Fantasia on "Greensleeves' (Arranged by Vaughan Williams), Minuet, Count of Luxemburg Waltzes, The Merry Widow Waltz, Moonglow And Theme From "Picnic"(from the Columbia Picture'Picnic"), Hernando's Hideaway & The Bohemian Girl Overture. RCA Living Stereo LSC-2213. Vinyl and cover both near mint. Satisfaction Guaranteed!